Salman Rushdie is a famous writer. He was born in a Kashmiri Muslim Family of Bombay and later migrated to Great Britain. Some of his well known books are 'Rome', ' Midnight's Children', ' Haroun and the sea of Stories' and the 'Moor's Last Sigh'. 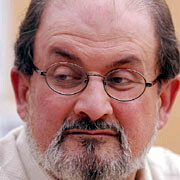 He commented against India in ' Midnight's Children' and made some critical references about Islam in ' Satanic Verses'. He created a world-wide furore and commotion with the publication of his book ' Satanic Verses'. Most of the books of Salman Rushdie have been subject to controversies and discussions. The publication of ' Satanic Verses' has raised a storm in the entire Muslim World. This made Iran's spiritual leader Ayatollah Khomeini sentence him to death. So presently he lives in hiding in England. The matter even led to Britain severing diplomatic ties with Iran. Rushdie's work Midnight's Children was awarded the 'Booker of Bookers' prize in 1993, which distinguishes as the best novel to have won the Booker prize over its 25-year history. In 1996 he received the European Union Literary Award in Denmark.